WEST Scholars will receive a 4-year scholarship, up to $5,000 per year, to complete a degree in the above STEM programs. Be a part of a cohort where you will get to know your fellow WEST scholars by taking classes side by side and network through your academic and extracurricular activities. Together, experience a lot more success and FUN! Getting into courses can be tricky as a student. Avoid the anxiety that comes from waiting for course registration and the risk of your class being full. WEST scholars will have course advising and early registration. Each WEST scholar will have a dedicated faculty mentor that will advise on courses, registration, and managing classwork. One-on-one attention will give West Scholars the assurance that they are on track for graduation and career or grad school placement. 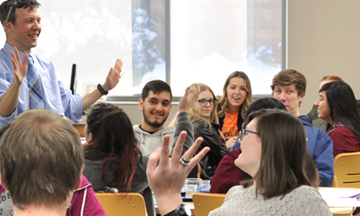 WEST scholars participate in a weekly seminar course designed to support students in many aspects related to college including campus resources, research experiences, leadership opportunities, and career development. Get to know more about the WEST Scholarship and apply! What is the WEST Scholarship? The WEST scholarship program is an NSF sponsored program to recruit more students to STEM degrees, financially support STEM students through graduation, articulate the strategies and resources available to them to successfully complete their degrees, develop student leaders, and provide professional mentorship to the WEST scholars. WEST Scholars are high-achieving students, interested in STEM careers, show promise to become community leaders in STEM, and have demonstrated financial need. Preference will be given to physical sciences (chemistry and physics), earth and environmental science, mathematics, computer science, and engineering students. Be one of the first to hear back about your applications by applying today. The WEST Scholarship committee will begin reviewing applications on January 6th, 2019. First offer letters will be sent out by February 15th, 2019. At that time WEST Scholars will be invited to meet with their faculty mentor who will assist them in preparing for Fall courses. We will continue to consider applications until all spots in the program are filled. like, and connect on social media. For now, use #weberstate and #westscholar to show some love!